Pow! Right in the kisser! Ekblad gets split WIDE open! It sure didn’t take long for Max Domi to make his presence felt in the Bell Centre. The feisty Montreal Canadiens forward acquired in an offseason trade from the Arizona Coyotes made his preseason debut with his new team tonight and went after Florida Panthers star Aaron Ekblad early on. The pair of budding stars went at each other behind the play before Domi dropped Ekblad with a nasty sucker punch. Pow! Right in the kisser! I mean… who is a Domi, after all. Ekblad left the game beaten and bloodied, while Domi was assessed a game misconduct. Already, fans and media are expecting supplemental discipline for the 23 year old Domi. 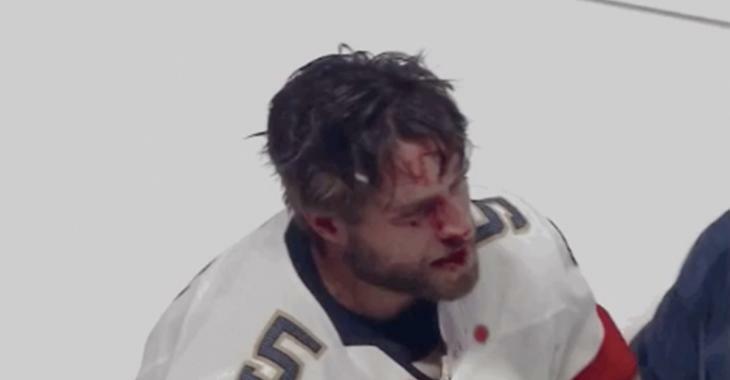 Max Domi sucker punched Aaron Ekblad and I wouldn’t be surprised if he’s suspended. That was cheap as hell. Habs Max Domi drops gloves and pops Panthers’ Aaron Ekblad with bit of a sucker punch to face, cutting him open. Domi is 5-foot-10 and 193, Ekblad is 6-foot-4 and 220. Domi gets a minor, major and match penalty. He’s looking to his left… 90 degrees.They were engaged. No doubt about it. Maybe Ekblad should be protecting himself better. But I’d have problem with the league trying to cut down on sucker punches. Domi, of course, was acquired by the Habs from the Coyotes this offseason in exchange for former 3rd overall pick Alex Galchenyuk. The 23 year old forward scored just nine goals and 45 points in 82 games with the Coyotes last season, but his rookie campaign in 2015-16 with the Coyotes in which he scored 18 goals and 52 points proves that he has some more offensive punch (excuse the pun) to his game. Tonight's game was expected to be a showcase event for Domi to play on the top line alongside another former top prospect Jonathan Drouin, but unfortunately for him his shenanigans with Ekblad put an early end to his night. Still, you can bet that Habs fans will fall in love with this guy if he continues to show this sort of grit and tenacity. Again... he's a Domi, after all.